We are very excited to announce that we finally received our BTB license and can now operate the Oceanside Cabanas! We are accepting reservations for each cabana as well as for both cabanas! We are listed on VRBO as well as AirBNB and we also accept direct bookings. Please contact us for all the details. We are also very excited to announce that we have hired a LOCAL Property Management Company~Placencia Property Management that will be helping our guests with the ck-in and answer questions related to operations of the property- We are planning on returning to Belize later in the year (and FINALLY have a vacation ourselves!….and yes, FINALLY enjoy all the amazing adventures that Belize has to offer!). Arregis Construction has been amazing to work with! From problem solving to finishing details, its all been a very positive experience. We broke ground late November last year and our crew worked thru rains, humid & hot seasons without batting an eye (we are currently finishing the punch list). We are also working thru licensing and government permitting and hopping to be opening the Oceanside Cabanas by September or October of this year- putting us right on schedule. Exciting times! Each studio cabana is approx 600 Sq Feet, cathedral wood beam ceilings (close to 10 feet tall). 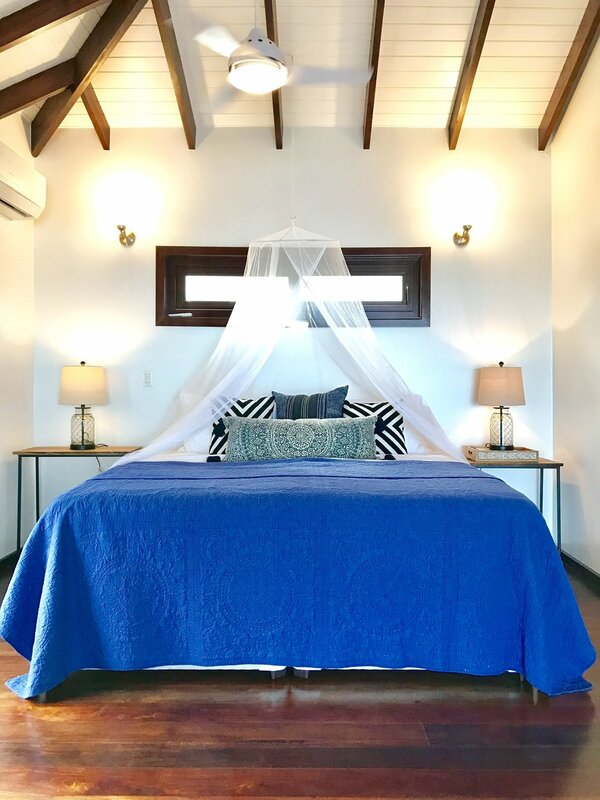 Both floor and ceilings are made of local woods, beautifully hand-crafted in a traditional Belizean style. The accordion/folding 4 panel-glass doors completely opens each studio to the beach, providing indoor-outdoor living Caribbean experience. When closed, each cabana is fitted with an A/C unit (even though there are windows on all sides) providing cross-ventilation and cooling the cabanas (with in 10 min time!) . Each cabana has its own full kitchen, and was designed to overlook the beautiful Caribbean ocean and palm tress on the beach while preparing a meal or coffee on the large Quartz counter top. They are fitted with stainless steel appliances and are completely stocked with pans /utensils/plates, etc (allowing you to prepare your own meals, if you choose to skip the restaurant). …After a long day of travel or a full day of activities ….relax in our King size beds with pillow soft top mattresses and luxurious soft high-thread count sheets for your most restful nights…. Each studio cabana has been set up with a King size bed, soft high-thread count sheets, SUPER SOFT and COMFORTABLE (PILLOW TOP MATTRESSES) for incredible comfort and a great night sleep ! The North Cabana has been perfectly designed to accommodate a couple with its King size bed. The South cabana is a little more flexible and can comfortably accommodate a couple with a King size bed or 2 single friends/family members (who wish to have their own comfortable LARGE bed). The King size bed on the South cabana can be turned into 2 separate extra large twin beds - (If your staying in the South cabana, just let us know your preferred sleeping arrangements and we can accommodate your individual needs). The beds overlook the ocean, so you can wake up to the sun rising over the beach (Of course!..). Each cabana has its own full bathroom with a marble counter top, a local custom made vanity and the bathroom shower floor tile is made from Mexican river stones. The outdoor space was designed to maximize the beach as well as lagoon views (…and is pretty amazing!). The common covered wood deck is close to 600 sq ft of covered outdoor living space~ and it’s 70 feet across between each cabana, uniting and separating both cabanas for privacy. There is a large outdoor table (overlooking the ocean on one side and the lagoon on the other)-so we don't ever have to miss a sunset or a sunrise! Enjoy our covered 600 Sq Ft indoor-outdoor living space…Perfect for breakfast brunches and cocktails with friends in the afternoon….tropical beach and sunset lagoon views are included. Our property is in the QUIET Plantation area -AWAY from the big crowds, but close enough for day visits to the Village. We are just 5 min drive to resorts with great restaurants. We are 20 min drive to Placencia Village/Airport. 30 min drive to jungles with waterfalls- Jaguar Preserve-Cockscomb Basin Wildlife Sanctuary (We have yet to see a jaguar.... after all they are nocturnal creatures) but not to worry, you will be surrounded by beautiful jungle trails leading to waterfalls and incredible 'top of the rain forest" views!! Renting a car is recommended: We love visiting (not so sleepy) Placencia and after fun activities in the village, we love returning to our QUIET Plantation-Maya Beach area. 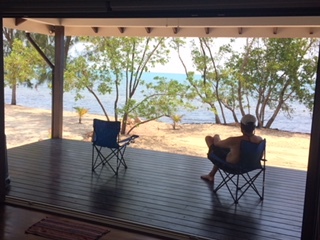 We are 20 minutes drive from the Placencia Airport and about 3 hour drive from Belize City Airport (Lots of car and golf cart rental options)- If your renting a golf cart-think easy slow "vacation driving" conditions. Couples, romantic trips, honeymoons, anniversaries, " Need to get away " trips. Two couples traveling together (book both cabanas during your stay) and each couple will have their own private cabana as well as the entire property to yourselves. 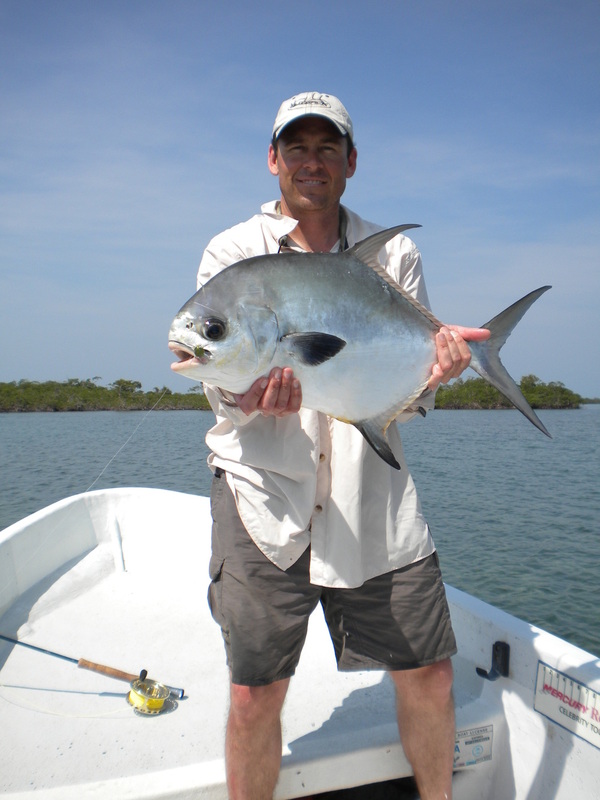 "Explore Belize ~Placencia as a retirement destination"
Anyone looking to explore Placencia~fishing/snorkeling/jungle/Mayan ruins activities, before you head out to other parts of Belize or Central America. Please note-Each cabana will be available to rent to individual parties, (max. 2 adults per cabana) meaning if you book one cabana, you may be sharing the common deck area and beach with another party (or us). The common deck area is over 70 FEET across between the 2 cabanas...allowing for each cabana to enjoy as much privacy (or socialize) as you desire. We have cleared and filled the lot and are in the drawing and planning stages of building the cabanas project. As we prepare to launch our new website, we received great news! We found out that our offer on the beach lot for sale in Maya Beach-Plantation area (that we visited last April) has been accepted! We are anxiously waiting to hear back from the closing Agent in Belize telling us that both survey and title are clean and ready. The Belize property is our latest project. We plan to build the beach cabanas by the Spring 2018 (keeping fingers crossed...). The property is east facing, sun rising over the Caribbean ocean and sun sets over the Mayan mountains, with unobstructed east and west views. We have been traveling to Belize for the last 10 years and felt right at home with this beautiful small Caribbean country, that lies right below Mexico. The white powder sand, calm beaches and crystal clear water along the Placencia Peninsula, surrounded by palm trees, jungles, mangroves was enough to make us come back time....and time.... and again. 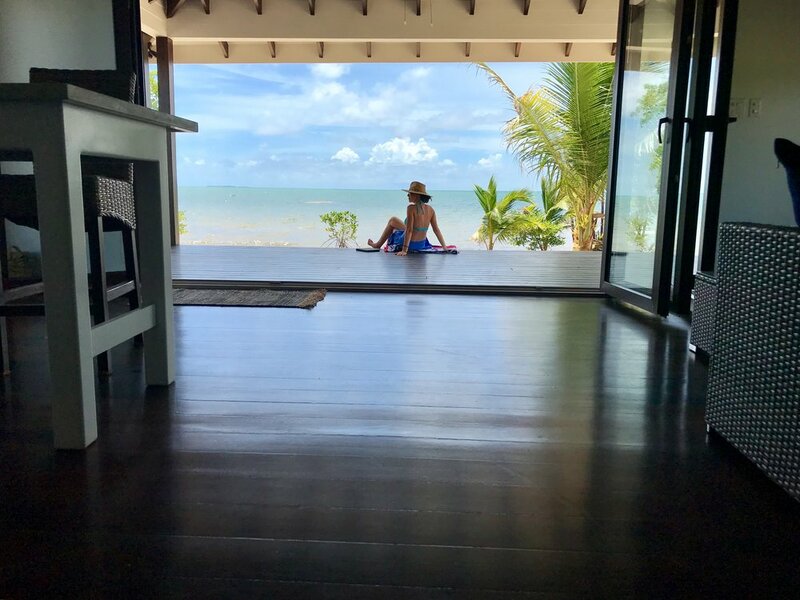 The perfect 80 degree climate, friendly locals and proximity to Colorado (4 hour flight from Denver) makes Belize the perfect winter getaway for our family.